« Texan, Westerns: The Watts Way! A Brand New Release From David Watts! This second interview with Jack and Judy Bonham takes place at an unspecified time and place. The subject? Their new novel, “Ruthless Angels.” Its direction? Onto the bestseller charts. This is a Western novel you may want to grab—and grab quickly so that you can say you were one of the first to discover their incredible talent. How would you describe your new Western, “Ruthless Angels“? Jack has always thought of the breadth and scope of this novel to mirror the sweeping storyline of Lonesome Dove, and with its historicity, it mirrors the 1960’s movie with Jimmy Stewart, How the West Was Won. Ultimately, it is the story of three sisters who do not kowtow to the way women were supposed to act in the 19th century. Women have always been free; it was simply up to them to take the initiative and move into their freedom. Ruthless Angels is the story of three sisters who had no trouble doing just that! How did the writing process unfold for this book? As usual for Jack & Judy, it all began with a dream. That’s right, this was a dream before it became reality, but if you think about it, all of creation was once a thought, even in the mind of God the Father before it was made real. God spoke reality into being. Read your Genesis and see. And God said let there be light and there was light. So, from the beginning, God the Father was a storyteller. He was telling the story of creation and as he told it, it came into being. All you Western writers out there know exactly how God felt. It’s an amazing process to think of something and then see it come into being. With writing, it becomes reality each and every time a person picks up the book and begins. The words create images in their minds and we’re off to the races. Judy writes down her dream, and we begin from there. I get the research done, which means looking at what happened along the way – the routes that each of the sisters took from Montana back to San Francisco. Jack’s read books where the history is bent to fit the characters, but he prefers to bend the characters and leave history as it happened. He writes each day, and Judy comes behind him and reads what he’s offered. Many times, what he’s put down is not accepted and she changes things to better fit her dream. Jack is in complete compliance with that. Judy and Jack know that they are about God’s business, so they try not to get in each other’s way, or in the way of the Holy Spirit that began the whole process. How do you feel readers will react to this new novel? Judy and I both hope that readers will fall in love with strong women characters who do more than complain about their lives, they actually do something to change how their lives are turning out. Jack originally entitled this work Three Sisters, and it was in imitation of Anton Chekhov’s play by that same title. What he didn’t like about the existential angst in the play was that the three sisters in the Russian play could not find a way to get what they wanted. They all wanted to go back to Moscow, but they never got there – a lot of talk and very little action. Americans do things differently. We don’t just talk about living, we LIVE! These three sisters know what they have to do, and they never, ever balk at the tasks at hand. Jack & Judy both feel that female readers will welcome the chance to be engaged with women who aren’t weeping over their so-called conditions, but women who are willing and able to act out in their lives so that their reality changes. As stated above, nearly all our Westerns are dreams that God the Father gives to Judy. As a matter of fact, just this weekend, Judy had another dream, and soon we will begin a Western that takes place just as the Civil War is coming to a close. That being said, there is the daily inspiration that Judy and Jack get from constantly story-conferencing. We might just be going into town from up on the hill and one of us will say something about a story we’re writing, and the next thing you know we have discovered more about our characters, and more about exactly where the plot is taking them. Plus, you can never discount the characters. Many times, Jack has had characters do things that were totally unexpected. When push comes to shove, trust your characters to know more about themselves than you do. Be receptive to the world around you and it will reward you with tangents and off-shoots, which normally you would not have expected. How long did it take to write “Ruthless Angels”? We’ve been working on Ruthless Angels for the past three years. It was a labour of love. Jack had books checked out that showed the overland routes of the stage coaches, which coaches from which companies went where. Also, Jack researched the paddle wheel travel in the northwest and how it was used by those who lived there. Making history a part of a novel does not disrespect history because they give what’s due to the historical events and weave their characters into those events. How did the story change from the initial inspiration to the finished product? You’ve seen pictures of yourself as a baby I’m sure. Now, take a look at a recent photo of yourself. This is how much the initial inspiration for the story differs from the completed novel. Inspiration is a baby that must be nurtured and fed. Grown up stories/novels are the product of a good up-bringing and plenty of food for thought. How did you handle the development of the characters? Most of the time, Judy and Jack let the characters help them along the way. In Christianity there is the still small voice of God. Well, in storytelling there are the still, small voices of the characters. One must be attuned to these voices and hear what the characters have to say about themselves. We do not outline, EVER! We let the story take us on the initial adventure. In fact, Judy & Jack have the most fun when the story is unfolding, when it is fresh and new. Do you foresee a sequel to “Ruthless Angels”? Could readers once again be called upon to read a second book in a series? It is unlikely that there will be a sequel to Ruthless Angels. We have discussed several of the characters and what could happen to them once that particular tale had ended, and Jack has an idea that the Anglican priest, Father Ned Papers, could have an adventure there in the city by the bay, but we shall see. Mostly, when a novel develops from a dream, it seems the novel revealed is complete, start to finish. Where do you think the Western genre is heading? Why do you think Western readers will enjoy “Ruthless Angels”? What’s the hook? The hook is easy: Three ‘helpless’ women take saddlebags full of gold back to their home in San Francisco. They are followed by the two hombres who shot up the miner that willed them the gold. Will they make it or will evil win? Sisters, Ruthie, Elizabeth, and Sally Jo were ripped from their posh San Francisco mansion and transported to wild Montana only to be left orphaned when their parents are killed by Indians. Then, a stranger who had been mortally shot rode up to their rustic cabin and bequeathed his findings from his gold claim to them before succumbing to his injuries. The girls disposed of the body just shortly before the killers rode in. The girls told the outlaws that the man had rode through, watered his horse and left. 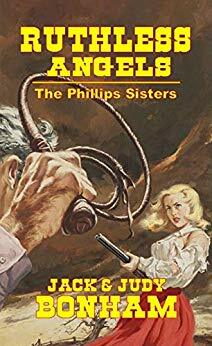 After the men were run off, the sisters decided to high-tail it back to San Francisco with their found money, but not wanting the bad guys to get all of the gold if they were to catch up to them, the sisters split up to meet back in San Francisco. After many months of travel and many trials and tribulations, all three sisters make it to San Francisco and attempt to begin a new life. But as fate would have it, Ruthie, the middle sister kills a man in self-defense, but the man turns out to be the son of one of the most prominent men in California. Now she stands accused of murder and the only thing that can save her are the journals her mother kept, which implicated the father of the dead man in an insurance fraud scheme. Love and intrigue abound when the Phillips Sisters set their sights on a target. Grab your copy today by clicking here.